Heidi from Rainy Day Ramblings (along with Lila@Babbling About Books) runs this fun Something Wicked Comes Halloween Blog Tour/Giveaway Hop which runs for the entire month of October. Reader Girls is once again participating in this hop (we hosted on October 1 with Thomas Winship's Vaempires series) and we are one of today's stops. We are pleased to announce that we are spotlighting author Kimberly Sabatini's debut YA paranormal novel, Touching the Surface. Since this is Kimberly's book birthday (congratulations Kim!) we are running our interview with the author. 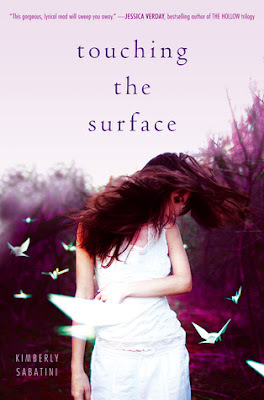 Our giveaway is for one hardcover copy of Touching the Surface. This contest is open internationally and ends on November 26. Please check out the full schedule here. 1) What is Touching the Surface about? Any special dedications? Experience the afterlife in this lyrical, paranormal debut novel that will send your heart soaring. When Elliot finds herself dead for the third time, she knows she must have messed up, big-time. She doesn’t remember how she landed in the afterlife again, but she knows this is her last chance to get things right. Yes, there is definitely a special dedication in this book--it's to my dad. He passed away about two and a half years before I started writing TOUCHING THE SURFACE. I didn't know it at the time, but my need to understand his passing informed the writing process for me. I also suspect I would never have been courageous enough to start writing again if it hadn't been for him. I witnessed what he left unfinished by dying young and it was a catalyst for me. 2) What would you like your readers to come away with after finishing your book? I don't actually want my readers to walk away with any specific bits of knowledge, I want them to walk away feeling as if there is someone else out there who thinks strange things. I want them to know that they are not alone in their desire to come at the universe from their own direction. I remember that's exactly how I felt when I read THE GIVER by Lois Lowry in 10th grade. It was such a rush of relief to find someone else in the world who had the same kinds of questions about life and humanity that I did. THE GIVER has remained my favorite book of all time because I'll never be able shake the way that Lowry connected with me. I would love for my writing to create a spark in someone else's life. 3) Some have said YA novels are too dark. Your thoughts? I love all kinds of YA--dark, humorous, contemporary or magical. In my humble opinion, a good book is a good book and I'll be drawn to it like a magnet, no matter where it takes me. But to specifically address the dark in YA. I believe that the reader finds the book that they need and that most kids will put down a book that makes them feel "in over their heads." I don't think adults give teens enough credit for being self-regulators, but I also don't think enough parents take an interest in what their kids are reading or wonder why they are reading it. My personal belief is that real life is much darker than fiction. Just turn on the nightly news or read National Geographic. Think about the bullying and disfunction that goes on in the hallways of our schools. Look closely at the TV, movies and videos games that we don't bat an eye at. Now take a really hard look at the kids that are killing themselves. I don't think it gets darker than that. It is my passionate belief that dark YA saves lives in two important ways. It gives a needy child someone to relate to--it makes them feel as if they are not alone. Despite our wish that they would do so, most kids are not going to come to school and admit to an adult or a friend that no one feeds them at home. They will not say aloud that they are cutting their skin in the hopes alleviating some of the pain that is bursting from their souls. They will not say that they have been raped or victimized in any number of ways. They will not shout out to the world that no one is listening--no one is watching--no one is helping. The characters in dark YA may be the only people they can relate to and the only hope they feel they have. If dark YA saves only one life, in my opinion it is worth having on the shelf, but we know from the public outcry in response to the WSJ article that YA has saved more than one life. I also believe that dark YA saves lives in a different kind of way--it gives our lucky children--our privileged and sheltered kids understanding and empathy. It gives them access and tools to be a better human being and it does this in a very safe environment. I don't know about you, but I want to live in a society of people who is raising their young to be MORE than the generation before them. I want to raise kids who think. We can no longer be afraid of our children changing the world we are comfortable living in. Instead, it's time to fear the possibility that we could raise a generation of kids who do not question bigotry, abuse, hatred and ignorance. I know it's cliche, but I believe all we have to fear is fear itself. 4) Any advice for aspiring writers? Young writers? Lots of recommendations, but my best advice is to speak openly and honestly. Your voice is not going to resonate with everyone, but if you write what you can not contain, there will be someone out there who will connect with what you have to say. It sounds counter intuitive to write for your self when publishing is such a big business, but I believe that the only way to do this is to have the authentic you get the book deal. We all know what it feels like to put on a facade to get what we want--to pretend to fit it. How long can you be something that your not? The pressure in the book world is tremendous, even when you follow your inner compass. Imagine what it will do to someone who does not know where their own true north lies. So often in the process I feel insecure. I struggle not to compare myself to those around me. I bite my nails wondering if I can live up to my own dreams. Those moments of fear never really go away completely--I'm always pushing them back. But I like to remind myself, that for every amazing person who has thought outside of the box and changed the world for the better, there were a bucket load of people who thought they were nuts--total Cracker Jacks. You can not expect to be a voice that matters--that makes an impact, without simultaneously being a voice that makes people uncomfortable. Point your compass to your own true north--then go big or go home. It always comes down to this for me--the only thing I really half to lose is myself. 5) What can readers look forward to from you? When does your next book come out and what are you working on? Readers can look forward to books that come from my own true north. Writing is ultimately a very important part of my own growth process and for better or for worse--I grow and write at about the same pace. Right now I am revising to sell my second book, THE OPPOSITE OF GRAVITY and I'm going to be drafting my third book for NaNoWRiMo called CHASING ADAPTATION. Trying NaNoWriMo is going to push me outside of my cozy little box, but I'm very excited about the ideas I have floating around in my mind. It's time. Hopefully, I'll have some official good news for you soon. 6, 7) Is there anything in YA that you haven't seen written/covered and would like to see more of? Who are some of your favorite writers? Who inspired/inspires you and why? My favorite authors and inspirations are Lois Lowry, Laurie Halse Anderson, KL Going, John Green, AS King and Ruta Sepetys for starters. It's simply that they write the way I aspire to write. They inspire me with their books and with their actions. I can not believe that I have their shoulders to stand on. Pretty much a pantster. I do a lot of mental gymnastics and twist that story around like a Rubix Cube in my mind, but I've never successfully written and outline in my life. I've always finished the writing and gone back and filled in the blanks later LOL! 9) Can you mention anything about your author affiliations (as a debut author) and what experiences you have had with them so far? I am a huge fan of the SCBWI. (The Society of Children's Books Writers and Illustrators) This group has been instrumental in my growth as a writer and a person. I can't recommend them enough. I am also a huge fan of Verla Kay's Blue Boards. Additionally, I must also stress how fantastic debut author groups are. I am a member of The Class of 2k12 and The Apocalypsies and when you sell your first book--run to the debut groups for the year of your book launch and dive right in. I promise you won't regret it. Kimberly Sabatini is a former Special Education Teacher who is now a stay-at-home mom and a part-time dance instructor for 3, 4 and 5 year olds. After her dad passed away in 2005, she used writing as a way to make sense of the experience and discovered that she’s full of questions that need to be answered. She lives in New York’s Hudson Valley with her husband and three boys. Kimberly writes Young Adult fiction and is represented by Michelle Wolfson of Wolfson Literary Agency. She is thrilled to be part of the "Wolf Pack." TOUCHING THE SURFACE is her debut novel. It is hard to pick just one...but today I will go with Jericho Barron's from the Fever Series. Thank you for another fabulous post! Happy book birthday to Kimberly! I have made a note to check out The Giver! Thank yi so much for being a part of Something Wicked! I never read specifically romance books, bu I am absolutely infatuated with Gus from The Fault in Our Stars, Zach from Shade, and Noah from The Unbecoming of Mara Dyer! Travis from Beautiful Disaster...or Lucas from Easy. Yumm!! I think Dimitri from Vampire Academy. Hmmm...from the Vampire Academy I love Adrian ! I'd have to go with Will from Masque of the Red Death by Bethany Griffin! I don't think I can pick from a romance novel, but in general Dimitri from Vampire Academy and Adam from the Mercy Thompson series both stand out. I have just discovered your exquisitely BEAUTIFUL blog, and am now a follower!! You have my favorite color -- BLUE -- all over the place, and I LOVE it!! Thanks so much for the giveaway, and I loved the interview!! Jon Snow from the series A SONG OF ICE AND FIRE by George RR Martin. Garrick Taylor of Losing It <3 Haha! I don't really read actual romance books, but one of my favorite book guys is Finn Belastra of Born Wicked. Will from Slammed and Point of Retreat by Colleen Hoover. Dimitri...for the vampire academy, i think that he is really hot! I like Bones from the Night Huntress series. Eric from the Sookie Stackhouse series. Thanks for the chance to win! I love Eric Northman from the Sookie Stackhouse Series!! I really don't know. I fall in love with all of them! Noah from the unbecoming of mya dyer!!! i dont read romance novels!! Hmm... that is difficult. Probably Adrian from the vampire academy if he was less of a drunk. Or maybe Raffe from Angelfall by Susan Ee..it's hard to choose. Maybe a mix of them and Augustus Waters from John Green's The fault in our Stars!